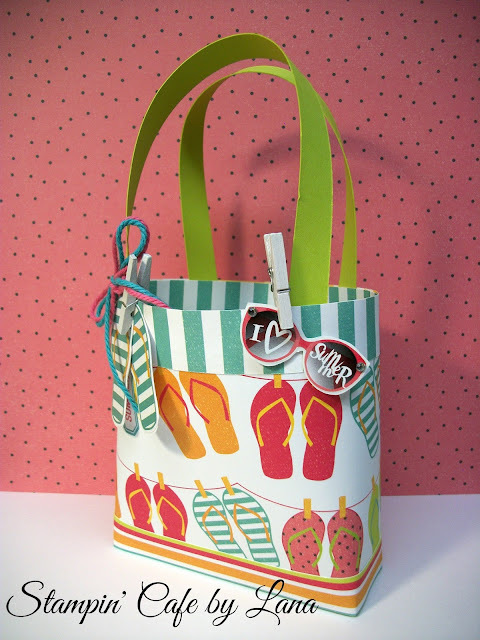 Stampin' Cafe by Lana: Summer "Beach Bag"
Here is a fun little bag for a summer gift! I made these type of paper bags back in 2015 (See that post here.) After I saw the darling papers in the PhotoPlay Summer Day Dreams Collection, I knew I had to make a summer version of the bag! I used the flip-flops and sunglasses stickers from the pack to add to the front of the bag, attaching them with tiny white clothespins. (I adhered the stickers to cardstock and then cut them out.) The straps and base of the bag were made with a lime green cardstock from Stampin' Up called Lemon Lime Twist. Just choose any bright colored cardstock that coordinates with the paper. Both of the striped papers used for the bands of the bag are from the Summer Day Dreams collection. The bag will hold a Post-It Notepad and pen, candy treats, small lotions, etc. I am going to add some pedicure supplies. Finished size of bag is 4-1/4 x 4-1/2 inches. With the handles, it stands approximately 8 inches tall. This bag varies slightly from the bags in the post mentioned above in that I increased the height of the bag to 4-1/2 inches and made the handles a little taller. The base of the bag remains the same. There is a You Tube video by Ophelia Crafts that shows how to put the bag together. Click here for that video link. 1. Make the base of the bag starting with a piece of colored heavyweight cardstock cut to 2-1/2 x 5-1/4 inches. Score at 1/2 inch on all 4 sides. On the long side, cut on the score lines up to the horizontal score line, fold and glue tabs to form the bag base. 2. Cut a piece of patterned paper to 4-1/2 x 12 inches. (Note: Double-sided paper works best so that the inside of your bag is pretty too.) Add sticky tape to the bottom and along one side of the 12-inch piece. Starting in the middle of one long side of the bag base, wrap this 12 inch piece around the base, starting with the side that does not have the vertical sticky tape attached. It will overlap slightly in the back when wrapped around. Remove the vertical sticky strip and attach to the rest of the wrapped piece. 3. For the bottom band on the bag, cut a strip of patterned or colored paper at 3/4 x 12 inches and wrap it around the bottom of the bag. Glue works best for this step. 5. For the top band, cut 2 strips of patterned or colored paper at 1 x 12 inches and attach around the top of the bag, one on the outside and one on the inside. Glue works best for this step.